Workstations are one of my favorite things to facilitate in my classroom. I tend to use workstations with a similar theme. For example if I am teaching instruments of the orchestra, I will create 4-6 workstations that review that topic. 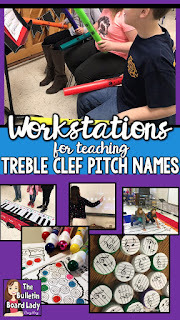 In this blog post I'm sharing some ideas for using workstations to review treble clef pitch names and practice using this skill. I know it sounds boring, but completing a note naming worksheet only takes a few minutes and provides me with a written assessment of their understanding. I always include worksheets in my rotation. You probably have a plethora of worksheets that would work perfectly. I have a growing bundle of worksheets that you might like for purpose. Download them HERE. Yes, old timey flashcards are a GREAT workstation to include in your rotation. Students can quiz each other or just quiz themselves. You could create a PowerPoint or Google slides show that could be used as digital flashcards too. In the picture above, my students are playing Treble Clef Uno by Amy Abbott. They aren't really flashcards, but do reinforce the pitch names while they play. I found this beauty at a local yard sale and snatched it right up. It is so fun to "dance" and play music. This big piano is great for several workstations, but in this rotation I just sat out a Recorder Karate book and a beginning piano book with a few pages marked. I've also used some simple folk songs as well. Students read the notation and played by stepping on the notes. Some clever students sat on the floor and used their hands too. My students love playing Boomwhackers and I love that they can use them to work together. I use a set of color coded folk songs from Musical Magic for Boomwhackers. I've printed them and laminated them (you could also use page protectors) and just set them on a stand near my Boomwhackers. FUN! I've also used desk bells (also colored like Boomwhackers) for this station. If I have a large group I usually add another center with some of those folk songs and a set of bells. The bells are much louder than the Boomwhackers so I have to find a place for them to work that won't disturb the whole room. Usually a corner or facing my desk works well. I use dabbers for any centers rotation I can because my students are 100% engaged when they use them. I have 2-3 worksheets available at this station for students to complete. You can read THIS blog post to learn about how I use dabbers in my classroom. You can take a closer look at the dabber worksheets that I've pictured above HERE. If you are a long-time reader of this blog, you know that I love recycling bottle caps to use in my classroom. I use them as note heads on staves I've printed on paper. It's fun to say a word and have students move their bottle caps on the staff to spell that word using the lines and spaces of the treble clef staff. I have a set that you can download in my store that contains the words (as answer keys) and a blank staff for this activity. See it HERE. You can also use the bottle caps as part of sorting activities. Read THIS blog post to learn about how to create a sorting workstation with bottle caps and dip and chip trays. It's a great workstation and you can download the notes shown on the bottle caps above in that blog post. This is an oldie but a goodie! Treble Clef Twister is pretty easy to play. I've used tape to create a staff on my carpeted floors. Now I use a shower curtain. I created the staff using electrical tape. Students use THIS spinner to hear "Left hand G!" or "Right food E!" Sometimes I'll create a station for assessment. I'll sit there with students and either quiz them with flashcards or have them complete an exit ticket. This gives me an idea of how much more I need to teach on this topic before we move to something else. In reality I am always reviewing pitch names and rhythms in 3rd through 5th grades, but a day of treble clef pitch workstations is always well spent. 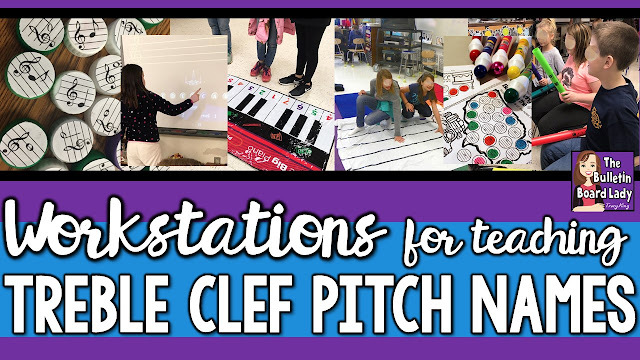 If you like these ideas for treble clef pitch name workstations, PIN this post for later.